Delfines de Miranda (Venezuela) earned their third consecutive title of the South American Clubs Championships, winning the 2003 edition with a triumph over Gimnasia y Esgrima (Argentina) 88-85 at "Belisario Aponte" Gymnasium of Maracaibo, Venezuela. Once again, the duo of Derrick Brown (197-F-73, college: Providence) and Victor David Diaz (195-F-68, agent: Capicchioni Luciano, college: Houston), named Most Valuable Player of the Championship, took charge of Miranda's offensive, although they find a lot of resistance from the argentinian's defensive line. The visitors were determined to take away the chrown, and even won the first two quarters 23-24 and 44-46. The third quarter ended in a tie 66-66, thanks mainly to the work of Jervaughn Scales (200-F-71, college: Southern), maintaining Gimnasia alive with his performance. The title was defined at the last minute of play, when the better shooting of the dolphins pointed the victory towads them. For Delfines, Derrick Brown (197-F-73, college: Providence) scored 21 points, Victor David Diaz (195-F-68, agent: Capicchioni Luciano, college: Houston) and Alex Quiroz (185-G-75, agent: Capicchioni Luciano) followed with 15 points each and Carl Herrera (206-C-66, agent: Capicchioni Luciano, college: Houston) added 12 more. For Gimnasia, Jervaughn Scales (200-F-71, college: Southern) scored 25 points and Franco Migliori (190-G-82) added 10 more. It was the third consecutive title for Delfines in this kind of competition and the 6th ever for venezuelan teams, while Argentina has won 7 times and Brazil is the leader with 20 victories in this competition. Duros de Lara (Venezuela) defeated Tanqueros del Zulia (Venezuela) 94-82 to win third place of the tournament. Two-time winner of the South American Clubs Championships, Delfines de Miranda (Venezuela) advanced once again to the Finals, defeating local rivals Duros de Lara (Venezuela) 84-78 at "Belisario Aponte" Gymnasium of Maracaibo. During the match, both teams shared the lead of the scoreboard. it was a very even duel until Miranda's head coach, Francisco "Paco" Diez , applied a special defense on Nick Davis (206-F-76, agent: Duran Emilio, college: Arkansas), forcing Nestor Salazar to reach the basket in other ways. Derrick Brown (197-F-73, college: Providence) and Carl Herrera (206-C-66, agent: Capicchioni Luciano, college: Houston) led Delfines with their quality. For Duros, Miguel Angel Marriaga (206-C-84) did his best to attempt a historic triumph, but it wasn't possible. Delfines will face Gimnasia y Esgrima (Argentina) this Friday night at 7:00 PM in "Belisario Aponte" Gymnasium of Maracaibo while Duros de Lara will fight against Tanqueros del Zulia (Venezuela) for the third place at "Mauricio Johnson" Gymnasium of Maracay. Gimnasia y Esgrima (Argentina) played their best basketball of the entire tournament to defeat Tanqueros del Zulia (Venezuela) 96-84 at "Mauricio Johnson" Gymnasium of Maracay. The argentinians earned the victory thanks to the perfect administration of a 10-plus lead throughout the game. Despites having a good set of tall players in the paint, Tanqueros was not able to stop Gimnasia's approach to the basket neither from inside nor the perimeter. The speed of the argentinians was a determining factor for their succeed. Jervaughn Scales (200-F-71, college: Southern) scored 19 points, David Scott (199-G/F-69, agent: Duran Emilio, college: Miami, OH) added 18 and Pablo Albertinazzi (176-G-78) finished up with 14. For Tanqueros, Daniel Dominguez (182-G-70) scored 17 points and the duo of Gregory Vallenilla (198-F-80) and Alexander Tovar (195-F-74) added 14 points each. Delfines de Miranda (Venezuela) had to recover from a bad start to finally defeat the strong RIberao Preto (Brazil) 94-90 at "Belisario Aponte" Gymnasium of Maracaibo. Delfines will face Duros de Lara (Venezuela) in the semifinals while Riberao couldn't advance to the next round. The Brazilians surprised with a 10-plus lead at the end of the first quarter, but Miranda started the come back slowly improving their level of play in the second period of play to get closer 44-37. During the third, Derrick Brown (197-F-73, college: Providence) started shooting from the distance to put his team back in front, and from that point on, they would never be down again. Angel Caballero (192-G-70) led Miranda with 22 points while Victor David Diaz (195-F-68, agent: Capicchioni Luciano, college: Houston) and Derrick Brown (197-F-73, college: Providence) scored 18 points each. Gimnasia y Esgrima (Argentina) forced an over time against Duros de Lara (Venezuela), beating them in the end 85-81 at "Mauricio Johnson" Gymnasium of Maracay. It was one of the most exciting games of the championship. With the triumph, the argentinians will face the second team of Group B, Tanqueros del Zulia (Venezuela), while Duros de Lara will fight against winners of Group B, Delfines de Miranda (Venezuela). Gimnasia applied a special defensive strategy on Nick Davis (206-F-76, agent: Duran Emilio, college: Arkansas) and Shelly Clark, which forced coach Nestor Salazar to apply a different approach to the basket. Duros lost the first period but then dominated the second and third quarter while the visitor's head coach, Enrique Tolcachier, used his bench to stay close in the match. Once the fourth quarter finished 74-74, David Scott (199-G/F-69, agent: Duran Emilio, college: Miami, OH) got inspired and led Gimnasia to an important triumph. For Gimnasia, David Scott (199-G/F-69, agent: Duran Emilio, college: Miami, OH) scored 29 points, including 6 triples, Jervaughn Scales (200-F-71, college: Southern) added 23 and Franco Migliori (190-G-82) put 14 off the bench. For Duros, Jesus Centeno (188-G-85) scored 21 points, Miguel Angel Marriaga (206-C-84) added 18, Nick Davis (206-F-76, agent: Duran Emilio, college: Arkansas) followed with 17 points and Carlos Cedeno (198-G-85) contributed with 14 more. Gimnasia y Esgrima (Argentina) suffered to defeat Paisas de Medellin (Columbia) 66-64 at "Mauricio Johnson" Gymnasium of Maracay. Prior to the match, they were clear favorites to earn an easy victory, but the game was totally different of what they expected. The argentinians were even one second away of loosing the match, when the columbians shot a three-pointer that cruised along the basket and did not enter in the last period of play. Jervaughn Scales (200-F-71, college: Southern) led Gimnasia with 23 points and 9 rebounds while Franco Migliori (190-G-82) added 13 points. For Paisas, John Giraldo (183-G-74, college: Monmouth) put 16 points on the scoreboard and Jamie Watson (201-F/G-72, agent: Malone Embry, college: SW Baptist) added 11 more. Duros de Lara (Venezuela) had to put out the best of their basketball to defeat the strong team Deportivo San Jose (Paraguay 95-82 at "Mauricio Johnson" Gymnasium of Maracay. The victory allows Lara to take one step to closer to the Finals, awaiting for what GImnasia y Esfrima (Argentina) will do against Paisas de Medellin (Columbia). The Juniors took control of the match during the first quarter, in which they even dominated the scoreboard by a 10-plus lead. But everything falled apart during the second and third quarter, where the paraguayans demonstrated their quality and their imported player, Quincy Alexander (202-F-73, college: Lamar), prooved what he was hired for. In the end, Duros regained control by applying a most effective defense strategy and a balanced offensive approach. Nick Davis (206-F-76, agent: Duran Emilio, college: Arkansas) was huge both offensive and defensively with 27 points, Shelly Clark (202-C/F-72, college: Illinois) followed him with 18 points and 10 rebounds, Gullermo Adrian (189-G-85) contributed with 12 points, Miguel Angel Marriaga (206-C-84) finished up with 11 points and Adolfo Guerra put 10 on the scoreboard. For San Jose, Quincy Alexander (202-F-73, college: Lamar) scored 27 points, Richard Brenton (202-F-78, college: Acadia) added 18 points and Javier Martinez (189-G-78) ended up with 17 more. Riberao Preto (Brazil) had no trouble dominating ESPE (Ecuador) 112.83 in the second day of action of the South American Clubs Championship. The game was played at "Belisario Aponte" Gymnasium of Maracaibo. The brazilians took revenge after being defeated by Tanqueros (Venezuela) in the opening matches. Jose Edvar scored 21 points, Lucas Tischer (207-C-83) added 17 and 'Renato' Pinto (203-F-78, agent: Martin Luis) finished up with 11 points. For Espe, Charles Mason (203-F-75, college: Bunker Hill) scored 24 points and Eric Cardenas (206-C-73, agent: Gramatikov Goran, college: Oklahoma Baptist) contributed with 22 more. The local duel among the leaders of the South American Club Championship's Group A, Delfines de MIranda and Tanqueros del Zulia, turned out to be a very exciting match that finished with a victory for the dolphins 83-79 at "Belisario Aponte" Gymnasium of Maracaibo. Tanqueros had taken a 10-plus lead after the first quarter, but Miranda attempted a slow come back that didn't pay off as they turned to the fourth period still down in the scoreboard. But in the decisive period of play, everything change and Delfines strenghtened its defensive line and bolstered their offensive strategies, which ultimately gave them a very important triumph. Derrick Brown (197-F-73, college: Providence) scored 27 points, Victor David Diaz (195-F-68, agent: Capicchioni Luciano, college: Houston) added 19 and 5 triples while Richard Lugo (209-C-73, college: St.Francis,NY) scored 19 points and grabbed 11 rebounds. For Zulia, Alonzo Goldston (206-C/F-74, college: Ft.Hays State) scored 21 points and waa followed by Elvis Montero (188-G-78) with 11 points and three shots scored from the distance. Duros de Lara (Venezuela) debuted with a victory in the 2003 South American Clubs Championship. Lara defeated Paisas de Medellin (Colombia), 88-71 at "Mauricio Johnson" Gymnasium of Maracay. Although the first quarter was very leveled, Lara's head coach Nestor Salazar never hesitated to make changes in order to bolster the team's offensive display. The result was a whole bunch of points coming off the bench, which helped the team gain a wider advantage as the minutes passed by. At the end of the third quarter, Duros already had a 20-point lead. Medellin never had a chance to come back despites playing quality basketball. For Lara, Derson Santos (190-G-84) scored 20 points, Nick Davis (206-F-76, agent: Duran Emilio, college: Arkansas) added 18 points and 10 rebounds, and the duo of Miguel Angel Marriaga (206-C-84) and Shelly Clark (202-C/F-72, college: Illinois) scored 15 points each. For Paisas, Leonardo Gutierrez (200-F-78) scored 16 points, Yader Fernandez (197-F-80) followed him with 14 and Carlos Mauricio Gutierrez (202-C-74, college: Lynn) ended up with 11. Delfines de MIranda, two-time champions of the South American Clubs Championship, debuted in the 2003 edition with an easy victory over ESPE of Ecuador 102-80 at "Belisario Aponte" Gymnasium of Maracaibo. The main offensive weapons of Miranda quickly took control of the match. Victor David Diaz (195-F-68, agent: Capicchioni Luciano, college: Houston) and Derrick Brown (197-F-73, college: Providence) scored 25 points each while Richard Lugo (209-C-73, college: St.Francis,NY), coming out of an injury suffered while playing a friendly match, scored 18 points to contribute to Miranda's cause. Tanqueros del Zulia, from Venezuela's LNB, defeated Riberao Preto (Brasil) 96-84 at "Belisario Aponte" Gymnasium of Maracaibo this monday night. 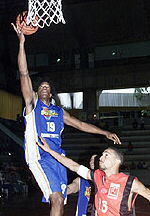 The game marked the debut of player Gabriel Estaba (200-F/C-65, college: S.Alabama) as head coach of Zulia. Tanqueros upgraded the team with Daniel Dominguez (182-G-70) of Centauros de Apure, Elvis Montero (188-G-78) of Guacharos de Maturin and the duet Omar Walcott (202-C-66, college: St.Peter's) - Jose Angel Hernandez (204-C-76), both from Tiburones de Vargas, all loaned by their teams while the tournament is played. The moves paid off as it was shown in this game, where the favorite to win was the brazilian squad. Elvis Montero (188-G-78) and Alonzo Goldston (206-C/F-74, college: Ft.Hays State) scored 22 points each for Zulia while Riberao Preto was led by 'Renato' Pinto (203-F-78, agent: Martin Luis) with 21 points and 'Tiagao' de Lima (202-C/F-80) with 15 more.